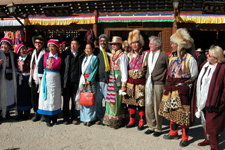 members other ethnic groups such as Liso, Dongba, Molimoso, Yi. Most of the population lives in mountain villages. Their livelihood includes agriculture, herding yak and sheep, and harvesting from the bounty of the forests. 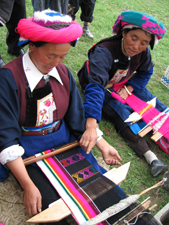 The region was once part of the tea-horse caravan trade route which stretched from Yunnan, Burma, and India to Tibet. It is home to a culturally diverse and colorful legacy of hand crafted wooden implements, leather goods, decorative architectural detail, pottery, silver jewelry, thankas, weaving and carpet making. Prefecture hosted a workshop “Planning for Diqing National Park Network and Sustainable Tourism.” A small group of local government officials and international experts shared plans and thoughts on developing a strategy for the future growth in tourism by creating a national park in Shangri-La. Diqing Prefecture is located in the far northwest corner of Yunnan, bordering Tibet, Myanmar, and Sichuan. Shangri-La is the name of one of the three counties in Diqing Prefecture (Weixi and Diqing being the other two.) It is also the name of the capital of the Prefecture. At 3,300 meters altitude, or more than 10,000 feet, Shangri-La is one of the highest mountain wetland regions in the world. Its reputation as home to the famous Khampa Tibetans and as a place of extraordinary natural beauty, Shangri-La has caught the attention of tourists and adventure seekers. Although measures are being implemented to safeguard Shangri-La from the ill effects of tourism development, there are still considerable concerns about maintaining the integrity of the local indigenous communities and protecting the environment. Diqing Prefecture was selected as a UNESCO World Heritage Site in 2003. Clear mountain lakes, virgin forests of pine and rhodendrum trees, the unusual geological occurrence of the three parallel rivers, Mekong, Yangtze and Salween, help make this region a perfect tourist destination. These mountain areas provide shelter for migratory birds including the endangered black neck crane. It is also home to endangered species such as the snub-nosed monkey and snow leopard. With elevations between 1500 and 5400m, the region is characterized by deep valleys and tall mountains, which have created extremely diverse climate, soil, and vegetation patterns, and unique and fragile ecosystems, such as high-altitude marshes, lakes and wetlands.